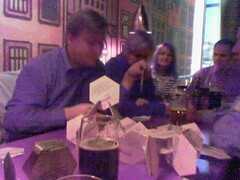 After a good meal (but much confusion with the bills) at Henrix BBQ, we’re at Rotterdam bar playing with the cool Hoegaarden beer mats, which slot together like a construction set. 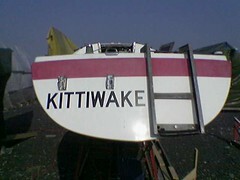 So we decided on a name for the H-boat: Kittiwake. 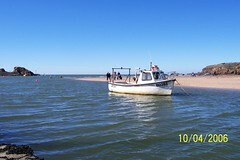 (For those who don’t know, it’s a type of small, white gull – suitable for a small, white boat). Arthur Ransome’s second boat was called Kittiwake (but his first boat was called Slug!). As the ice has mostly left and it’s started to get sunny and warm, it’s time to fix up the boats ready for launching. Right now I’m spending every evening on the boat: cleaning, fixing the gelcoat, and soon waxing above the water line and painting with anti-fouling paint below. 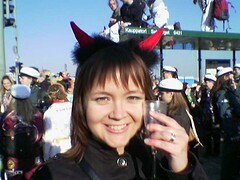 Next Saturday & Sunday will be spent mostly at the boat, though I’ll have to finish early on Sunday as it’s Vappu! 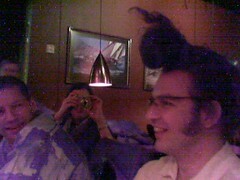 My best guess right now is that the boat will be ready by the end of the weekend after Vappu, i.e. 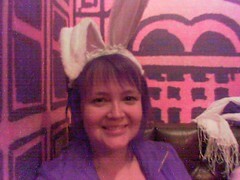 6-7th May. Then I’ve just got to book a crane-lorry for launching it. 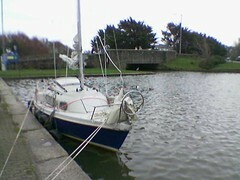 While out for a walk today, I noticed this small yacht on Bude canal – obviously she had recently been sailing on the sea. She’s about the same size as our new H-boat, and reminded me (as if I needed it) of our hopes for the H-boat this summer. 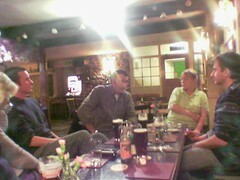 Dad & I visited Gareth & Zennor at Keveral farm. It was raining lightly, so we decided to visit Carnglaze Caverns – after all, it probably doesn’t rain underground (though in fact, the cave ceiling may have been dripping more frequently). After going underground and seeing the subterranean lake, we reemerged back into the rain. 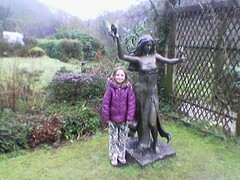 We noticed the first of the bronze fairy statues in the ‘enchanted dell’, and Zennor posed next to it. “Which of us is more pretty?” she asked. I went for my usual long walk around Bude, including the downs overlooking the beaches, Summerleaze beach, the breakwater, the canal and the ‘castle’. Bude is a very beautiful place, and the weather couldn’t have been better – sunny and warm, but with a rather cold breeze. It always gives me a great feeling of calm and unwinding as I wander around the places familiar from my childhood. I feel very lucky to have a home town like this. When you’re staying with my Dad, you end up drinking a lot of these! 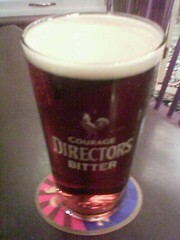 (Not just Directors, but Worthington’s Cream Flow and lots of interesting real ales).